When Bath Township Police Officer Michael Lapham first created a Facebook page for the department, it began as mostly unremarkable. As the department’s K-9 officer, Lapham did not have enough time at first to dedicate to the Facebook page, BTPD Officer Avery Lyon said. When Lyon and Officer Trenton Bailey joined the department, they showed interest in improving the department’s social media, Lapham said. 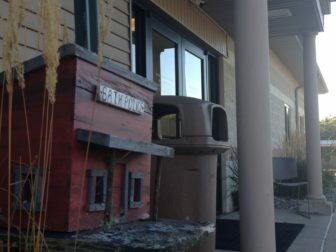 A wooden model displayed outside of the Bath Township Police Department. Lyon and Bailey were able to attend a social media training session, and the three officers acted to revamp the department’s social media strategy. Now, the page has 24,132 followers – a following more than 10 times as large as the population of Bath itself. Two years after the department adopted their new strategy, Lyon said the page’s impact is dramatically different. 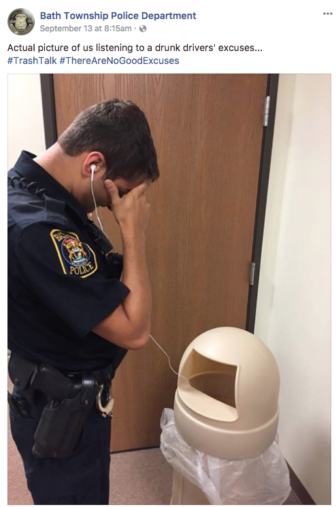 Bath’s page is even influencing other law enforcement organizations. 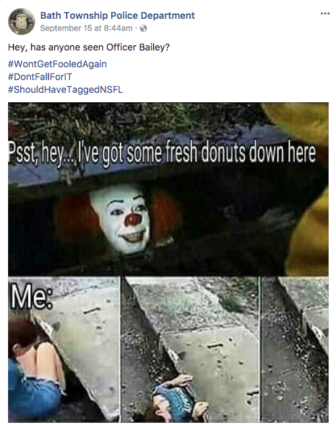 While Bath Police have seen increased outreach, their page has also conferred additional benefits: on occasion helped the department do their jobs. 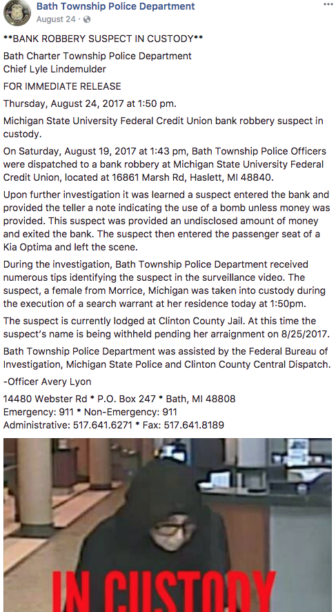 A bank robbery was reported to the public via the page, and within a day, the department received a tip that lead to the suspect’s arrest, Lyon said. Lapham said the bank robbery post was one of his favorites because of its impact. He also is fond of those featuring his K-9, Aiko, though he admits he is biased. 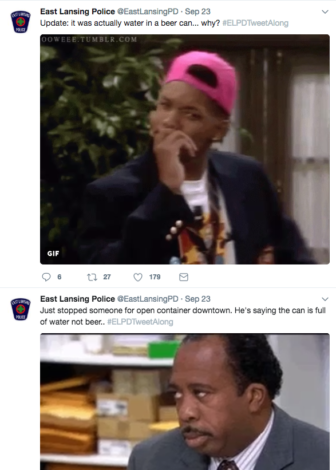 Informational posts are important, Lyon said, but the ones he has the most fun with are those messing around with the East Lansing Police Department. 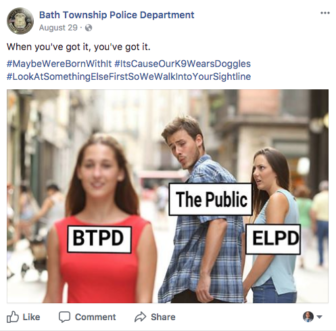 ELPD Social Media Officer David Dalen said Bath’s page has been an influence on their department’s social media strategy, which they’ve expanded to include “tweet-alongs” and other outreach efforts on different platforms.